As some people may be aware I am a great fan of Dave Murray from Iron Maiden and did say I am creating a lesson to show off his style of playing. Maiden has often relied on guitar parts to bring things to life nothing is hard would you believe it no part of the guitar part is rock hard. I looked at the solo work and Dave tends to use a lot of legato playing and sticks in minor scale, minor blues or Dorian. The work of Maiden guitar players like Dave is very straight forward and so unbelievable he gets away with just sticking around in boxes and it works. The example I am about to show you are all from the early days some of which I turn into my own work of art using the ideas from Maiden but you will never loos that Maiden sound. Example 3 Another very interesting part is the double stops. All this is playing two notes in one go. 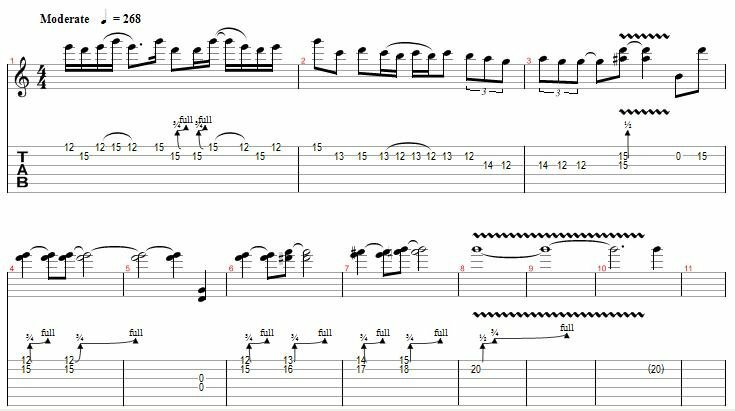 Dave uses this technique when making a run although he probably never notice it but I do feel that it might have come from he blues playing days. He was into blues in a big way so it became apart of something that he now does. Example 6 We now move to the new style of Maiden if one ever existed? okay lets have a look at the title song Man on the edge this is once more shows of Dave style of playing but will not give you the full solo due to copyright and I don't want to be kicked from doing my lessons. Hope you understand! Notice that you have pull offs, bends, vibrato, and double stops then unison bends as well at the end. The unison you should pick the sting bent to the correct note. Look harder than it actually is just take your time and you get it very quickly. Everyone in Maiden is essential (except maybe the drummer) but Harris is the brains. Anyways I played in a style very similar to Dave Murray before I listened to him and now hes one of my great influences. Adrian Smith also has some good solos.